United States Marine Corps Corporal Kevin Vaughan, of the Third Battalion, 6th Marine Regiment, was wounded in Afghanistan in September of 2011 when the vehicle he was traveling in struck an 80-pound pressure plate (improvised explosive device) while he was carrying out combat operations in the Southern Helmand province in Afghanistan. Five marines were severely injured. Corporal Vaughan was transported by medevac to Bagram Airfield for immediate treatment before being transferred to Germany, and then to Walter Reed National Military Medical Center in Bethesda, Maryland. He spent 15 months at Walter Reed. Corporal Vaughan sustained serious injuries to both legs, and despite several surgeries, doctors were unable to save his left leg, which was amputated below the knee. He also suffered plantar fasciitis and nerve damage to his right foot, left shoulder tendonitis, degenerative joint disease to his lower back, tinnitus, traumatic brain injury, and a left hand fracture. His right leg had to be reconstructed with rods and screws. 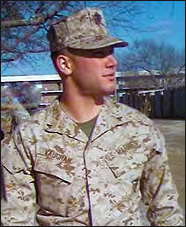 For his service to his country, Corporal Vaughan earned the Purple Heart, the Combat Action Ribbon, Navy Unit Commendation Medal, Good Conduct Medal, National Defense Service Medal, Afghanistan Campaign Medal, Global War on Terror Expeditionary Medal, Navy Sea Service Ribbon, and the NATO Medal. Building Homes for Heroes gifted Corporal Vaughan with a mortgage-free home, built from the ground up, in Nassau County, New York. exempt from federal income tax under Section 501(c)(3) of the Internal Revenue Code.